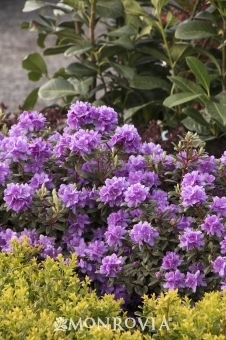 This beautiful dwarf rhododendron has large trusses of lovely purple spring flowers that provide a beautiful contrast to the green foliage. A very compact evergreen shrub that is perfect for small gardens in cool, damp climates. A terrific choice when a small accent plant with great presence is needed. Equally well-suited for a low hedge. Moderate growing; reaches 3 ft. tall, 4 ft. wide.